or an ICP (Internet Content Provider)? The power behind the Nightwalkerbiz. As you can see not everything is on a large scale. 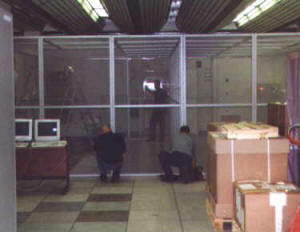 Nightwalkerbiz has a 12' X 14' chain link cage that houses all of our computer equipment. This is done to ensure the security of our equipment, as the space is shared by many customers and a cage keeps our equipment secure from the common area, and yes the whole area is security secured by state of the art alarm systems and armed guards to ensure everyone's equipment is safe secure. 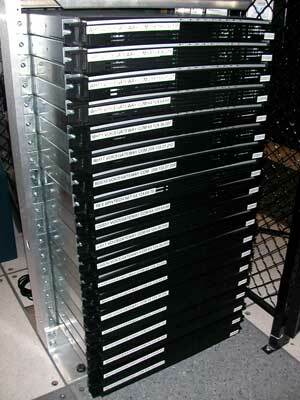 Nightwalkerbiz has over a 650 pieces of equipment at this server center to run all the services that we provide. For our servers we use semi-common PC type components in a special case called a rack case. There is not much difference than what a lot of people use for home computers, the difference being the case and the number and power of the CPU's and of course multiple hard drives. no doors or side panels.It is completely open to accommodate air flow. and wired up to the core switch. to run all the computers in the Sydney Data Center alone. We utilizes a BGP blend of multiple carriers at many of our facilities. Cogent - Holding One of the highest ranked connectivity degrees on the internet AS174. Level3 - An enormous American multinational telecommunications/ISP provider with a history of flawless connectivity around the globe. With Cogent, Level3, Internap, ATT, QWEST, Sprint, Global Crossing, and more in our bandwidth mix, you will be receiving lightning fast interconnectivity for your websites visitors regardless of their location around the globe. We also utilizes a GRE tunnel to provide hardware based, high redundancy DDOS protection. Traffic is routed and then inspected, filtered, and analyized in the event of a DDOS attack. You can count on high availability for your business website, email, and hosted projects. We do over 200 million page views per month with nearly 900 million total hits (including graphics) to our customer websites. We send over 120 million legitimate emails over the course of a month. Nightwalkerbiz not only runs its own servers, but controls it's own nameservers unlike many other hosting companies. As a professional hosting center we also replicate this setup in eighteen other locations world wide. to the switchers and core units. Our servers run dual dual/quad core Intel Xeon CPU's with 16-32 gigs of ram and with Fully redundant RAID-10 drive arrays. We exclusively use the Linux CentOS operating system in a highly modified form, since it provides a reliable and robust platform for web hosting environments. We control our centers remotely, from three locations, in the Sydney area, with full remote server systems located in South Bend Indiana, Fulshear Texas, Houston Texas, Lenoir North Carolina, Schertz Texas, Parsippany New Jersey, Atlanta Georgia, Scranton Pennsylvania, Docklands London, Qala Singapore, Sydney Australia, Melbourne Australia, Mountain View California, Orlando Florida, Roubaix France, Rotterdam, The Netherlands, Chicago. Seemingly, there are many choices when it comes to picking a Web hosting provider. However, when you add up all the facts, the choice becomes clear. Discover the reasons why our hosting is the right choice for you. At The Gatekeeper we offer competative prices, and rock solid service. We are not the cheapest out there, like some of our CRAZY competitors, but we do not over sell our servers at our clients expense, just for a quick buck. Trusted by More than 10,000 Customers Worldwide. We must be doing something right, with over 270 main line Web servers & numerous other servers used for special requirements & 100 VPN servers, combined with 144000 IP addresses and over 10,000 happy clients worldwide. So what’s the difference you ask from us to them, simple “rWE CARE” and have the experience in the Linux Hosting Business. We have built our systems on the backbone of the LINUX kernel and have implemented the cPanel Web Hosting Management System with our clients in mind, for ease of use and versatility, the cPanel/WHM system is second to none in the hosting world. As your needs go higher, we will be at this stage with you, the more you need the more we give you, the more you trust us the closer we become, the more clients we have the more new services we offer, remember, we are here for you! Houston Datacenter - Houston TX. Nightwalkerbiz's new LINUX HYBRID servers, are housed in much the same manor as our Sydney Data Center. These beasts consist of Intel Xeon Multi-processor multi-core servers, with Fully redundant RAID-10 drive arrays for faster I/O. With Multiple providers over multiple locations, the building sits atop three redundant electrical grids from TXU delivering diverse power to each quadrant of the building. HVAC needs are supplied via five one hundred ton onsite water chillers to deliver N+1 cooling requirements. Home to over twelve switch sites and thirty-five different carriers. There are 32 servers in total, not including our routers and switching gear. Which fills our Security Safe cage, housed in the same Data Center as our old HUB1 servers, located in downtown Houston Texas. Docklands Data Center - London UK. London Docklands Data Center is one of the very few carrier-neutral premier class data centers in England. The Data Center delivers fast, reliable servers predominantly in the London Docklands. The datacenter features 24/7 security with visual ID checks before entering the building and entrance to the data floor limited by PAC/swipe tag access. Docklands offers the best quality bandwidth from their transit providers. Bandwidth is routed through powerful Cisco equipment with a mixture of Tier 1 transit straight to the network equipment. The providers include Level 3, Tiscali and NewNet and the upstream providers peer in most major UK Internet Exchanges including LINX, Xchangepoint, and Lipex to ensure a reliable, fast network. The AtlantaNAP is Atlanta's large scale datacenter and disaster recovery center. Built by the owners of Global Net Access after 12 years in the Internet business, the AtlantaNAP boasts the features of a carrier class facility. Atlanta NAP operates a metro Ethernet ring based on Extreme Networks 10 Gig technology. It has Sonet-like EAPS implementation for sub 50 ms re-route times, utilizing Ethernet for efficient and affordable equipment connectivity. They have collocation in Telx at 56 Marietta and Switch and Data at 56 Marietta and offering 100MB and Gigabit Ethernet metro cross connects to any one of the more than 100 carriers located in the Telx building. The Atlanta NAP is monitored at over 450 points by a state-of-the art digital building management system. Staff can log in securely from any location and check on all systems. 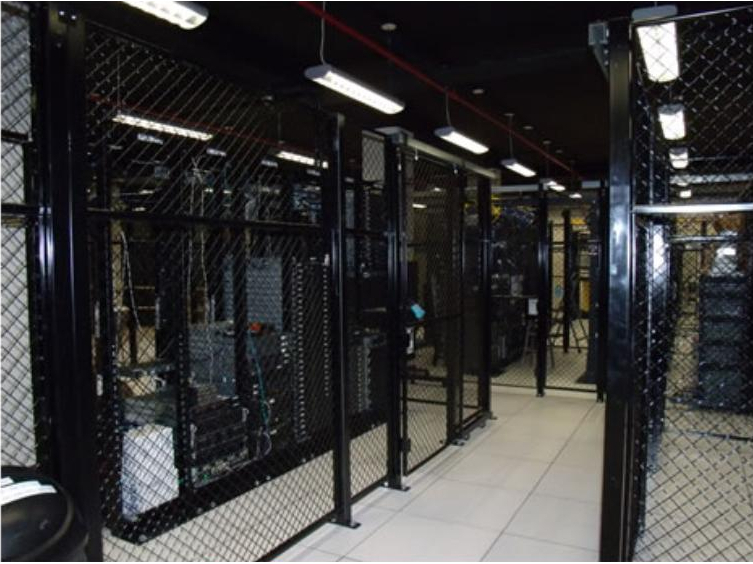 The data center uses a state-of-the-art dual interlock dry pipe fire suppression system. High-tech smoke detectors signal the pipes to switch from compressed air to water. NAC Data Center - Parsippany NJ. Network Access Corporation's (NAC) data center, in Parsippany, N.J. NAC maintains one of the largest and most fault tolerant networks in the United States. NAC is connected directly to most of the major networks including Sprint, UUNET, Cable & Wireless, PSI, Global Center, Savvis, AOL, Exodus, and many others. The network infrastructure is guarded, monitored, and staffed 24 hours a day, 7 days a week. NAC has made significant investments in equipment from major vendors such as Cisco, Livingston, and 3Com/USR. Qala data center is a 20,000 sq ft state of the art Internet Data Center in Singapore. Qala Data Center's network has been designed to accommodate clients demanding the highest quality network performance. There is a central focus on redundancy allowing its network to rapidly self-heal failures without interruptions to connectivity. Qala data center has multiple network connections to different Internet backbones, allowing data to be distributed though many sources - meaning that the Qala network is not dependent upon any single Internet backbone. Network Operations Center Inc. - Scranton PA.
feet of raised floor data center space, 3,000 square feet of telco-style space, plus a high tech Network Operations Center. The network is connected via Gigabit Ethernet handoff's with 1000mbps on redundant dual-path DWDM fiber-optic transport connections to Commonwealth Telephone™, Verizon™ and PPL Telecom™ and multiple other providers. The Network Operations Center utilizes ONLY top name brand hardware. The network is centered on a Cisco GSR12000 Border Routers, and Cisco 7206VXR Core Routers. Hardware utilized in the facility is comprised of name brands, including the following: Intel, Asus, Abit, AMD, 3Com, Hewlett Packard, Adaptec, Cisco, Tekram, Kingston, Micron, Crucial, IBM, Maxtor, Western-Digital, Seagate, Quantum, Fujitsu, Realtec, Belkin, and Lucent. The Network Operations Center uses industry-standard SNMP (Simple Network Management Protocol) and provides round-the-clock monitoring of all hardware, including routers, switches, UPS systems, and servers. Web Template created by Nightwalkebiz.